Honeywood is a 17th-century house of chalk and flint chequer-work that acts as a heritage centre for the London Borough of Sutton. Honeywood hosts exhibits on the local history of the area, including a special exhibition on the Tudor palace of Nonsuch. Other featured exhibits are toys from the Edwardian period and local railways. 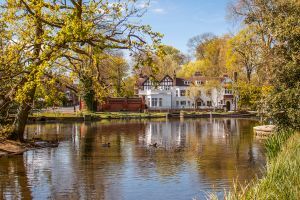 The house stands just a few yards from the water's edge at Carshalton Ponds, in one of the most picturesque areas of any London suburb. The exterior of Honeywood belies its age; on the outside, it looks like a comfortable Edwardian house, but at the core of the house is a 17th-century chalk and flint building. Honeywood house was built beside Carshalton Ponds sometime in the middle of the 17th century, on the site of an earlier flint and chalk building dating to the 17th century. The early history of the house is confusing, for it was named Wandle Cottage, and stood beside another house called Honeywood. When the first Honeywood was torn down in 1884 Wandle Cottage was renamed Honeywood. The location was an odd one to choose for a house; it was built over the outflow from several springs. One possible explanation is that Carshalton was known for the purity of its water at that time (almost anyplace outside the urban centre of London had cleaner water than the inner city residents!). It is entirely possible that Honeywood was used as a commercial cold-bath, since bathing in cold water was believed to have great health benefits at the time. The house was let by absentee owners through the 18th and 19th centuries. One tenant was a sugar and slave trader, another was a writer and friend of the Pre-Raphaelite group of artists. In 1883 John Kirk, a salesman and later a company director for a photographic company, purchased both Honeywood and Wandle cottage and knocked down the original Honeywood, expanded Wandle cottage, and renamed it. The house was extended several times in the early 20th century and eventually purchased by the local council in 1939. During WWII Honeywood was used as a training centre for air raid wardens, and after the war was over it was rented out for functions and offices. In the 1980s the house was restored and re-opened as a local heritage centre. The house has been beautifully restored to show how it would have looked in the Edwardian period. Visitors can see the early 20th-century billiard room, kitchen, drawing room, and bathroom, to get a glimpse into the lives of families who called Honeywood home. The house is filled with exhibits telling the story of how Sutton developed over time. See a Tudor gallery, an exhibit on the Wandle River and how it helped shape the history of the Carshalton area, and an art gallery with changing exhibits throughout the year. One feature that families will enjoy is a childhood room filled with toys from the Edwardian period. There are exhibits on local history and archaeology dating back to the Bronze Age. One of the most appealing features of Honeywood is its location beside Carshalton Ponds. There is a very modest entrance fee to the museum. Location: 4 miles west of Croydon, on the A232. Five minutes walk from Carshalton railway station.